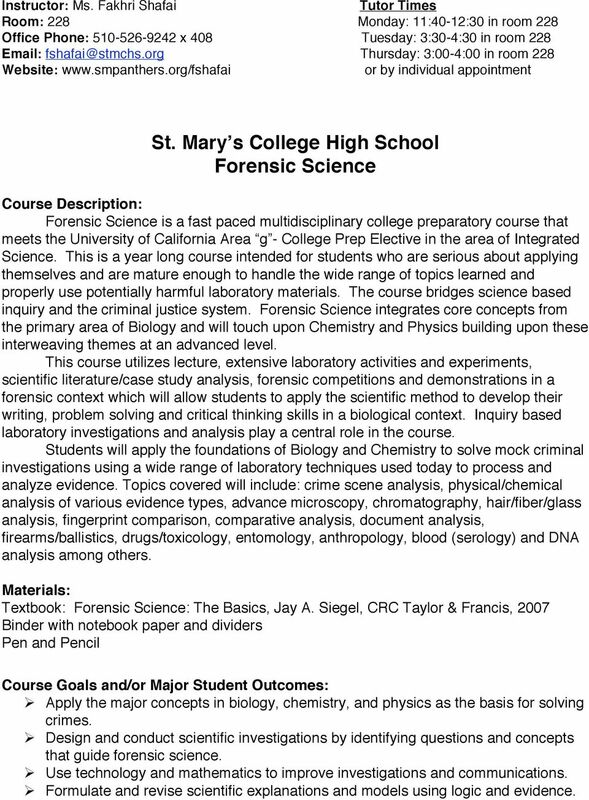 Download "St. Maryʼs College High School Forensic Science"
1 Instructor: Ms. Fakhri Shafai Tutor Times Room: 228 Monday: 11:40-12:30 in room 228 Office Phone: x 408 Tuesday: 3:30-4:30 in room Thursday: 3:00-4:00 in room 228 Website: or by individual appointment St. Maryʼs College High School Forensic Science Course Description: Forensic Science is a fast paced multidisciplinary college preparatory course that meets the University of California Area g - College Prep Elective in the area of Integrated Science. This is a year long course intended for students who are serious about applying themselves and are mature enough to handle the wide range of topics learned and properly use potentially harmful laboratory materials. The course bridges science based inquiry and the criminal justice system. Forensic Science integrates core concepts from the primary area of Biology and will touch upon Chemistry and Physics building upon these interweaving themes at an advanced level. This course utilizes lecture, extensive laboratory activities and experiments, scientific literature/case study analysis, forensic competitions and demonstrations in a forensic context which will allow students to apply the scientific method to develop their writing, problem solving and critical thinking skills in a biological context. Inquiry based laboratory investigations and analysis play a central role in the course. Students will apply the foundations of Biology and Chemistry to solve mock criminal investigations using a wide range of laboratory techniques used today to process and analyze evidence. Topics covered will include: crime scene analysis, physical/chemical analysis of various evidence types, advance microscopy, chromatography, hair/fiber/glass analysis, fingerprint comparison, comparative analysis, document analysis, firearms/ballistics, drugs/toxicology, entomology, anthropology, blood (serology) and DNA analysis among others. Materials: Textbook: Forensic Science: The Basics, Jay A. Siegel, CRC Taylor & Francis, 2007 Binder with notebook paper and dividers Pen and Pencil Course Goals and/or Major Student Outcomes: Apply the major concepts in biology, chemistry, and physics as the basis for solving crimes. Design and conduct scientific investigations by identifying questions and concepts that guide forensic science. Use technology and mathematics to improve investigations and communications. Formulate and revise scientific explanations and models using logic and evidence. 2 Recognize and analyze alternative explanations and models. Communicate and defend scientific argument. Students will use their newly acquired knowledge and skills to answer questions, solve problems (crimes), and communicate effectively supporting their conclusions. Assessment and Grading Procedures: Students will be assessed on their cumulative performance in the following areas: Science Content/Concepts: (20%) A variety of scientific concepts will be explored throughout this course. Students will be expected to be able to discuss scientific principles and how those principles relate to forensic science. Vocabulary and terminology will be taught and students are expected to demonstrate an understanding of said terminology when appropriate. Evaluations: (20%) Students will be expected to do a variety of research and opinion papers that require students to thoroughly examine a given topic and find scientific support for a stance on that issue. 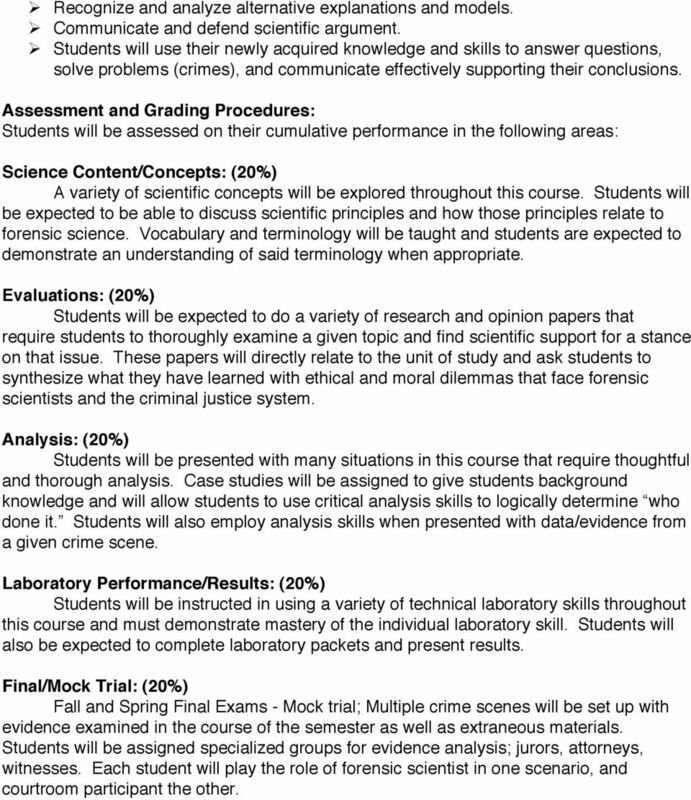 These papers will directly relate to the unit of study and ask students to synthesize what they have learned with ethical and moral dilemmas that face forensic scientists and the criminal justice system. Analysis: (20%) Students will be presented with many situations in this course that require thoughtful and thorough analysis. Case studies will be assigned to give students background knowledge and will allow students to use critical analysis skills to logically determine who done it. Students will also employ analysis skills when presented with data/evidence from a given crime scene. Laboratory Performance/Results: (20%) Students will be instructed in using a variety of technical laboratory skills throughout this course and must demonstrate mastery of the individual laboratory skill. Students will also be expected to complete laboratory packets and present results. Final/Mock Trial: (20%) Fall and Spring Final Exams - Mock trial; Multiple crime scenes will be set up with evidence examined in the course of the semester as well as extraneous materials. Students will be assigned specialized groups for evidence analysis; jurors, attorneys, witnesses. Each student will play the role of forensic scientist in one scenario, and courtroom participant the other. 3 Grades: Grades are based on points earned. 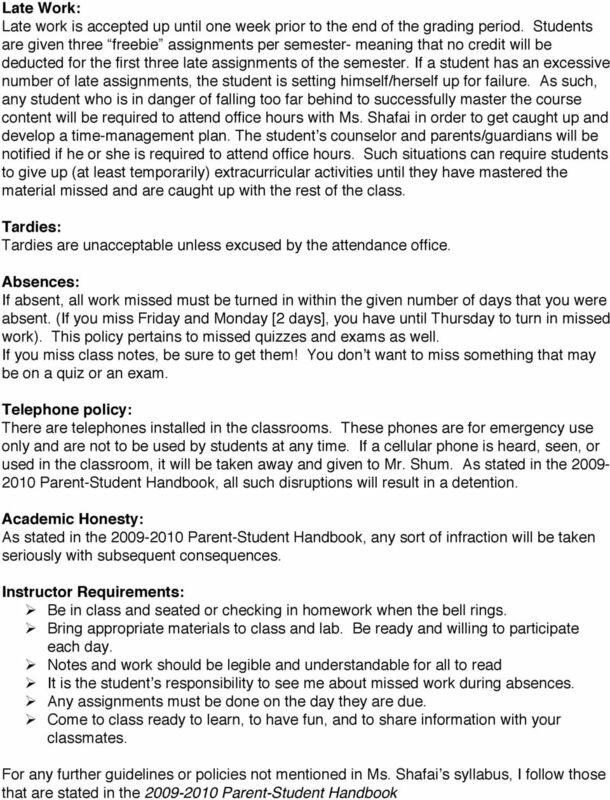 If you have any questions, please talk with Ms. Shafai. 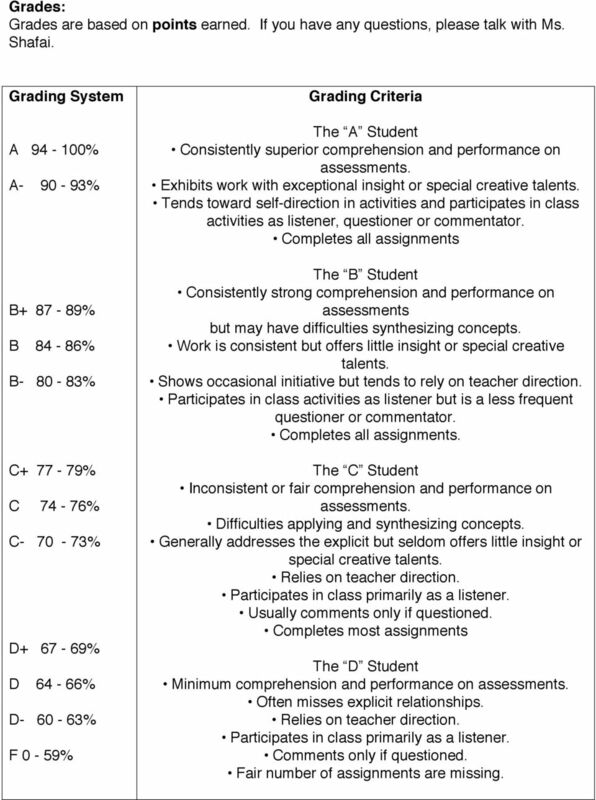 Grading System A % A % B % B 84-86% B % C % C 74-76% C % D % D 64-66% D % F 0-59% Grading Criteria The A Student Consistently superior comprehension and performance on assessments. Exhibits work with exceptional insight or special creative talents. Tends toward self-direction in activities and participates in class activities as listener, questioner or commentator. Completes all assignments The B Student Consistently strong comprehension and performance on assessments but may have difficulties synthesizing concepts. Work is consistent but offers little insight or special creative talents. Shows occasional initiative but tends to rely on teacher direction. Participates in class activities as listener but is a less frequent questioner or commentator. Completes all assignments. The C Student Inconsistent or fair comprehension and performance on assessments. Difficulties applying and synthesizing concepts. Generally addresses the explicit but seldom offers little insight or special creative talents. Relies on teacher direction. Participates in class primarily as a listener. Usually comments only if questioned. Completes most assignments The D Student Minimum comprehension and performance on assessments. Often misses explicit relationships. Relies on teacher direction. Participates in class primarily as a listener. Comments only if questioned. Fair number of assignments are missing. 5 Forensic Science signature page I,, have read and understand the policies listed in the Class Syllabus. STUDENT SIGNATURE:. I,, have read and understood the policies listed in the Class Syllabus. PARENT SIGNATURE:. P.S. Please print this syllabus for your records. It is best to have it done BEFORE our first class session. Brown, Neil M. and Stuart M. Keeley. Asking the Right Questions: A Guide to Critical Thinking, 11 th ed.